(2016). Finding the best angle, between carbon nanotubes and four groups of antibiotics, using computational methods. International Journal of Bio-Inorganic Hybrid Nanomaterials, 5(3), 195-202.
. "Finding the best angle, between carbon nanotubes and four groups of antibiotics, using computational methods". 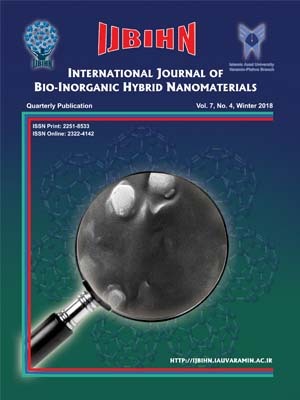 International Journal of Bio-Inorganic Hybrid Nanomaterials, 5, 3, 2016, 195-202. (2016). 'Finding the best angle, between carbon nanotubes and four groups of antibiotics, using computational methods', International Journal of Bio-Inorganic Hybrid Nanomaterials, 5(3), pp. 195-202. Finding the best angle, between carbon nanotubes and four groups of antibiotics, using computational methods. International Journal of Bio-Inorganic Hybrid Nanomaterials, 2016; 5(3): 195-202. In this work, the first in the world of science, the focus was on the best angle of connection between carbon nanotubes and the most widely used group of antibiotics. While having the highest stability, in terms of energy, we have the best angle of to connect to the in vivo delivery of intraoperative antibiotic binding with carbon nanotubes not lost. It will never work in the world of science. Connecting the carbon nanotube and antibiotics precise targeting to sites of infection within the body and a much lower dose of antibiotics is needed. Because of the sensitive nature of the initiative was measured 4 times per connection to ensure the accuracy of the results is sufficient and also because of the novelty of attitude associated with that particular phase diagrams were drawn at each stage to witness the results of the arguments made. In this work, the four antibiotics: penicillin, tetracycline, Ampicillin and gentamicin were used. Appropriate connect between carbon nanotubes and antibiotics, respectively Carbon nanotubes and penicillin 177°.Carbon nanotubes and Tetracycline 201°. Carbon nanotubes and Ampicillin 172° and Gentamicin and Carbon nanotubes 189°.